Princeton senior Adam Bragg has finally done it – he has finally claimed the outdoor pole vaulting conference record. In the process, he became the second man in Ivy history to clear 18-feet at the Outdoor Heps championships. He cleared 18-01 3/4 on his second attempt, breaking Penn’s Mamadou Johnson’s meet and conference record of 18-01 1/4. Princeton picked up a much needed 18 points in this event as August Kiles finished as the runner up with a height of 16-09 1/4. Dartmouth’s Max Cosculluela was third in 16-04 3/4, edging Columbia rookie Robert O’Brien and Harvard’s Andrew Roney for position based on misses. In the men’s 800m preliminary round, all of the qualifiers are within 2 seconds of each other. Penn senior Drew Magaha was the fastest in 1:50.05 while Indoor Heps 800m champ Josh Ingalls of Princeton was the last qualifier in 1:51.10. Other qualifiers include Brown’s Zach Emrich (1:50.33) and Ned Willig (1:50.65), Princeton’s Noah Kauppila (1:51.60), Columbia’s Alek Sauer (1:50.38) and Josiah Langstaff (1:50.72), and Harvard’s Myles Marshall (1:51.89). Columbia’s Sam Ritz and Taylor Click did have qualifying times within that 2 second window, but did not make the cut due to them not make an auto berth. Meanwhile, Max Hairston is looking to reclaim his 400m hurdle title (in addition to his high hurdle title). The Cornell senior ran the fastest time of the intermediate hurdlers – 52.59. Princeton got four qualifiers – Greg Leeper (53.02), Spencer Long (52.63), Christian Fryer-Davis (53.13), and Jordan Myers (53.50). Alec Eschholz will be joining Hairston in the high-intermediate double final as he ran 53.34. The Dartmouth rookie will be one of three Big Green in the final with Ed Wagner (53.71) and Parker Johnson (54.73). Five of the men who made it to the 100m finals have made it to the 200m finals. Cornell’s Zach Menchaca ran the fastest qualifier again – his time 20.96 is the fifth fastest in meet history. He will be joined by Princeton’s Carrington Akosa (21.20), Cornell’s Alex Beck (21.42), Brown’s Ryan Kelly (21.47), and Cornell’s Brailin Paulino (21.72) as double-finalists. Single finalists include Cornell’s Larry Gibson (21.53), Harvard’s Max Mondelli (21.75), and Brown’s Oluwatosin Oyewole (21.75). Heptathlon update – Princeton’s Taylor Morgan gained ground on Harvard’s Madison Hansen in the shot put. Morgan threw a new personal best in the throw – 43-04 1/2 – to win the event and get 742 points. Hansen had the second best finish with 37-06 3/4 to get 625 points. Morgan leads the overall competition with 2496 points while Hansen has 2431 points. Hansen closed the gap some on Morgan in the 200m. Hansen had the second fastest time in the field with 25.43. Princeton’s Maia Craver had the fastest time in the field; she was the only athlete under 25 seconds (24.95). At the end of Day 1, Morgan leads the field with 3305 points, followed by Hansen (3279), then Dartmouth’s Allison Frantz (3152), and Princeton’s Kerry Krause (3047). Day 1 of the heptathlon is complete. 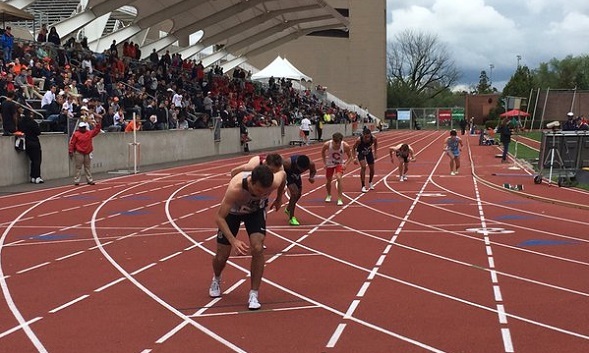 The men’s preliminary rounds are done – the women’s preliminary rounds will begin with the 1,500m at 3:15pm. This entry was posted on Saturday, May 7th, 2016 at 1:41 pm. It is filed under Heps Champs, Spotlight. You can follow any responses to this entry through the RSS 2.0 feed.